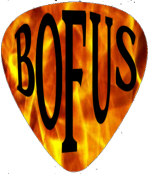 Hailing from the heartland in Blue Springs, MO, Bofus grew out of a childlike need to play music that falls in the alternative rock, hard rock, and classic rock genres. The band consists of its founders, Rusty Mainard and Kevin Scott. Rusty plays drums, keyboard, guitar, bass, and contributes vocals, Kevin Scott is a vocalist and guitarist. However, the group would not be complete without additional vocalist, bassist, and guitarist, Mike Criger. The band’s name is slang for (the both of us) and it can be attributed to the two initial members responsible for establishing the group: Rusty and Kevin. Bofus is directly involved in arranging, recording, mixing, and producing all studio work at their home facility – The Vault Recording in Blue Springs, MO.